When the General Data Protection Regulation (GDPR) goes into effect on May 25, 2018, you will have to adopt a few email marketing practices to comply with the law. Zoho Campaigns has come up with the most essential functionalities that help you address the GDPR requirements. With Zoho Campaigns' double opt-in process, you only let subscribers who are genuinely interested in hearing from you onto your mailing lists, i.e., every individual that submits data through a sign-up form will receive a confirmation email with which they can either accept or deny their subscription. 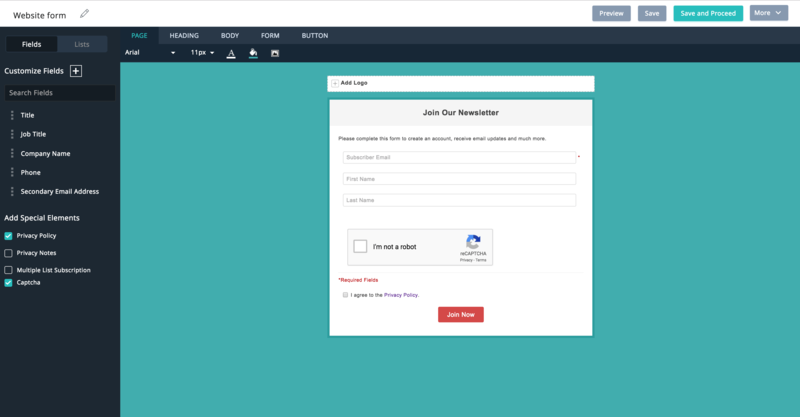 Simply put, double opt-in is your way to build clean and healthy mailing lists. You might process subscribers' data for varied purposes, but in order to align with the data processing principles of GDPR, you are required to determine the right lawful basis for each purpose. 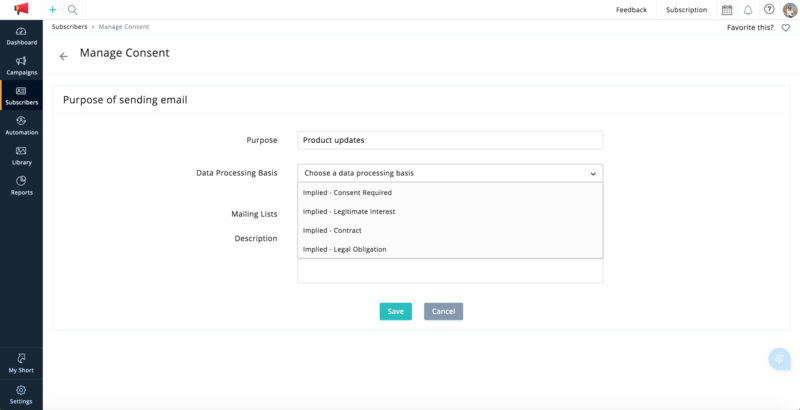 Whether your purpose for processing is single or multiple, Zoho Campaigns' GDPR-compliant email marketing lets you process data under one of these six lawful bases—Contract, Consent Required, Legal Obligation, Legitimate Interest, Public Tasks and Vital Interest. Adopting this method helps you organize the way you collect and handle personal data. Note: We always recommend that you approach legal counsel to advise on identifying the appropriate lawful basis for each of your data processing activities. If your data processing purpose comes under the Consent Required lawful basis, send consent emails to subscribers before sending out marketing emails. This way, you make sure that subscribers who have shown their interest through events, trade shows, or webinars have explicitly expressed their consent to engage with you. Zoho Campaigns also allows your subscribers to deny their consent for a particular purpose with the Deny option in consent emails. The Right of Access mandated by the GDPR means that subscribers can access their personal data, whenever they wish to. Make your subscribers feel secure that you are using their information in the right way. 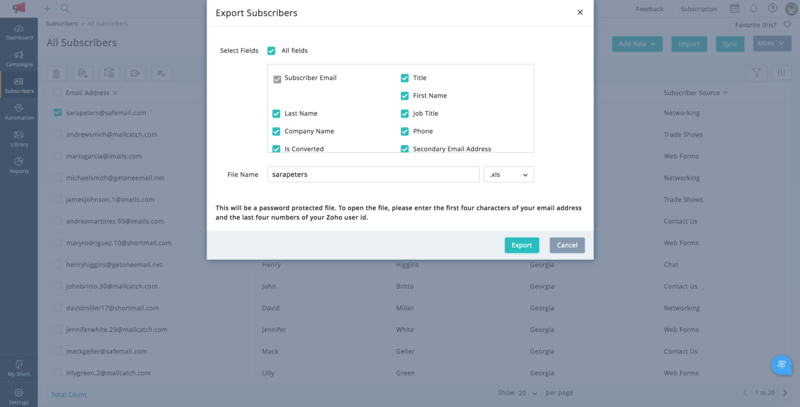 Zoho Campaigns lets you export subscribers' personal data in machine-readable formats so you can email the data as and when they request. Note: Any file that contains subscriber information should compulsorily be password protected. We recommend that you export the data only upon your subscribers' request and you remove the data once you have shared it with them. 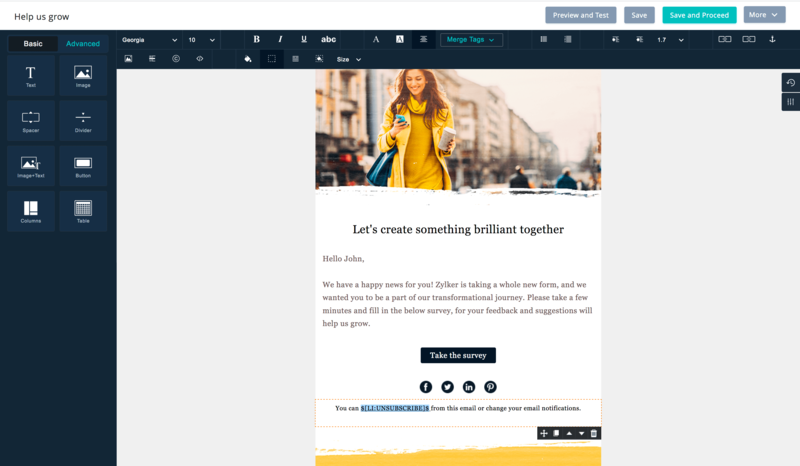 Maintain transparency in your email marketing by including Imprint details, which carry the email sender's information such as their name, contact information, and Tax Identification Number (TIN). 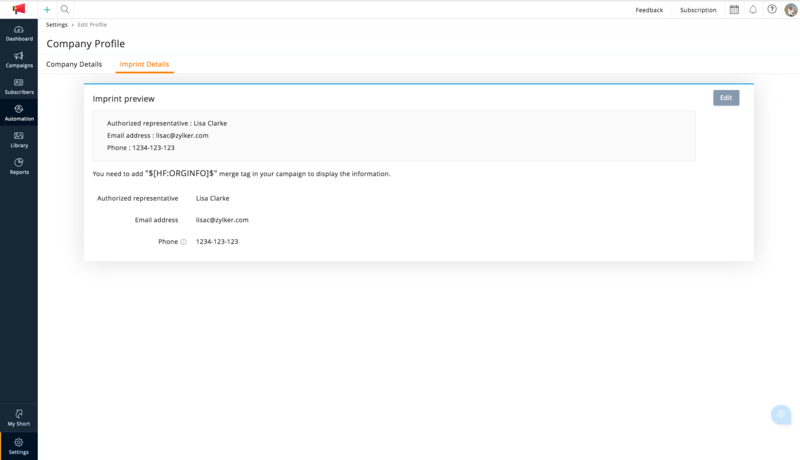 Zoho Campaigns mandates that you include the Imprint Information merge tag in all your emails. Note: Details about the name of the authorized representative and contact email address are compulsory under the Imprint Information. Other details such as the organization address, contact number, and TIN are optional to include. Remind your subscribers why they receive a particular email from you. Zoho Campaigns mandates that you specify the source from which you received subscribers' information, while creating a mailing list. 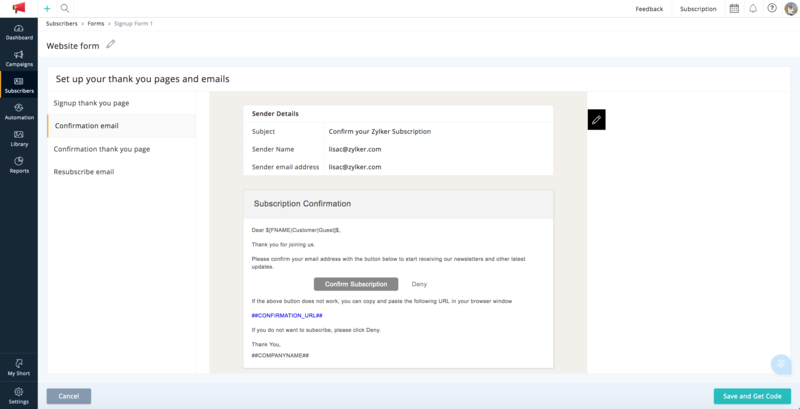 This description will automatically get added in the footer of your emails. Target subscribers with engaging and timely content based on their interest by including a subscriber preferences merge tag in your email. 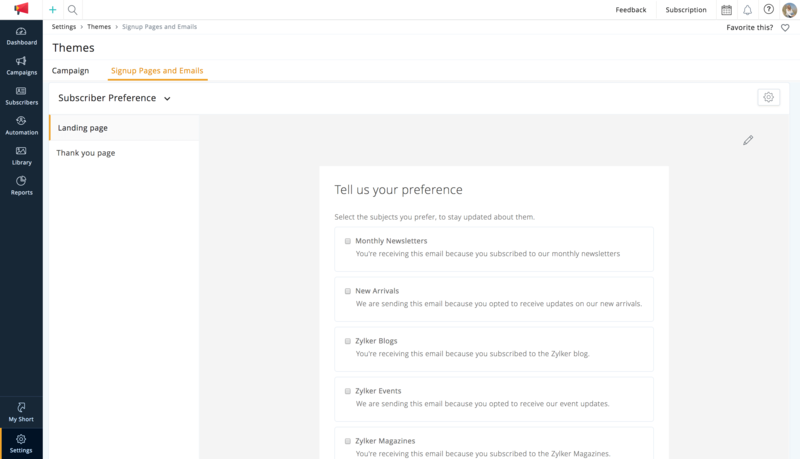 This makes it easy for your subscribers to update what type of emails they'd like to receive, thereby increasing your engagement rates. As with the Right to Rectification under the GDPR, subscribers should be able to edit their personal data as and when needed. 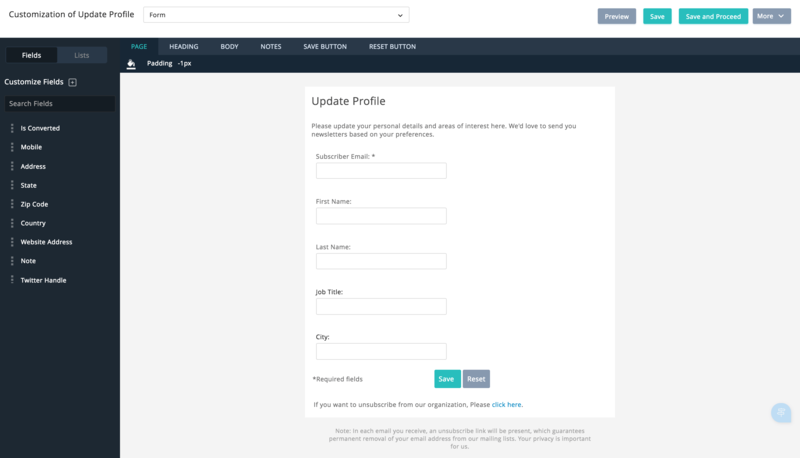 Zoho Campaigns facilitates this by including an update profile link in your email footer. Subscribers have all rights to request you to delete their personal information, as mentioned by the Right to Erasure/Right to be Forgotten under the GDPR. 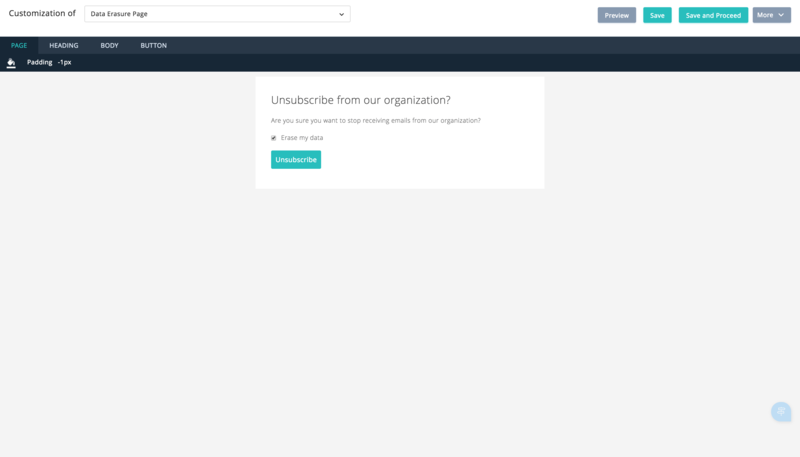 Whenever a subscriber feels their information is no longer necessary for your organization, they can access the unsubscribe link from the email footer, where an option to erase personal data is provided. Since data protection is one of the key aspects of GDPR, storing subscribers' information with utmost security becomes vital. 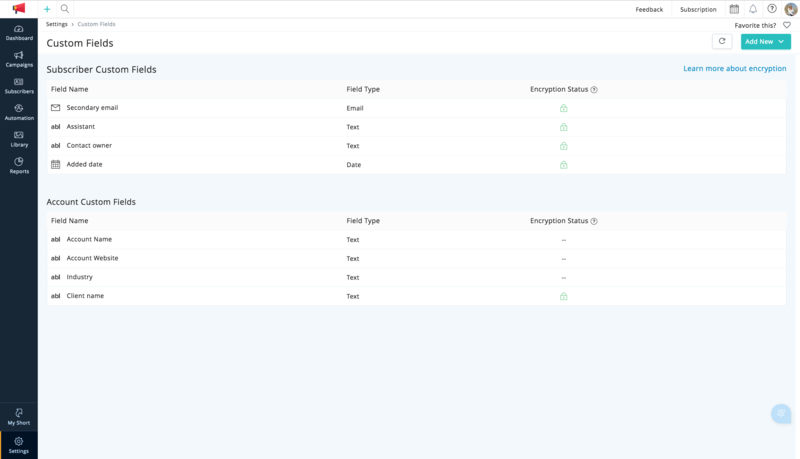 Zoho Campaigns makes this easier with its Custom Field Encryption, an option that lets you encrypt subscriber custom fields with just a click. 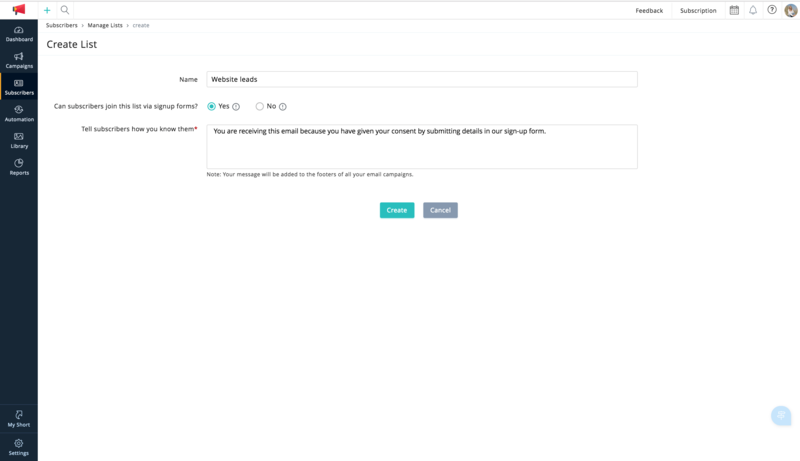 Maintain healthy mailing lists and reduce spam complaints by moving unengaged subscribers off your lists. By default, Zoho Campaigns has an Unsubscribe link in the footer of your emails. This makes it easy for subscribers to leave your mailing list or organization with just a single click. The process also allows subscribers to erase their information from your organization if they wish to, as mentioned under the Right to Erasure/Right to be Forgotten. Disclaimer: Compliance with the GDPR requirements is possible only with the combination of people, process, and technology. Zoho Campaigns has made the best efforts to provide solutions that you can use to comply with the law. The information presented here should not be taken as legal advice. We always recommend that you approach legal counsel to advise on the best ways to ensure GDPR compliance.